Here's the early view of the W.F. Laraway house on Front Street which I promised last week. Mr. Laraway is showing off his prized Marmon Motor Car. I believe it is a 1913 or 1914. 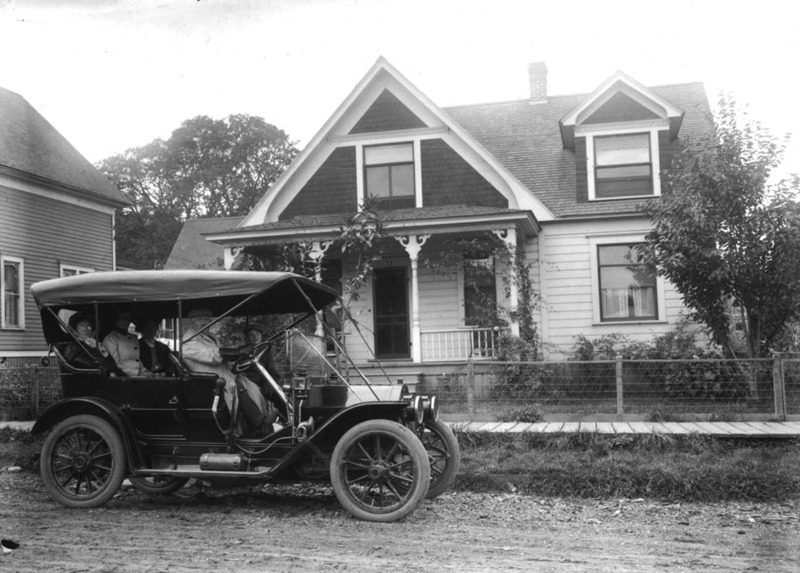 Dan Fletcher has carefully documented this fine car with copies of the service records from the Foust & Merle Machine Shop and Garage, which was conveniently around the corner at First and State Street. It's surprising how much maintenance the car required each month. For example, during the month of June, 1915, it got new brake linings, a brake adjustment, 5 dry cells, "recharging Presto", work on the steering and "cleaning whistle" for a total of $81.20. That's about $2000 today! This was not a particularly unusual month. This is a good time to remind you our friends at WAAAM have their annual Fly-In this weekend. It's a great time to see all their antique aircraft and automobiles, as well as the many visitors who will show up. I always start with the Saturday morning breakfast so I have plenty of fuel for the day. And while WAAAM does not have a Marmon, they have many other cars from that era. I always linger in the "brass era" section enjoying all the machines that aren't quite sure if they're a carriage or an automobile. Thanks Arthur for the details. Evidently manufactured on the shores of Lake Maxinkuckee, Indiana. Was it right-hand drive, or is the negative reversed? Interesting that the steering wheel is on the right hand side. Was this the norm back then? Those new brake linings would have just been on the rear axle as the car did not have front brakes. Great for HR hills. Tank on the right running board is for the carbide lights; would have been another on the left. Right hand drive was common in early US cars. The negative is not flipped. It took a couple of years for left hand drive to dominate. The little boy would be W. F's son Percy in the front seat with him.